We don’t celebrate Thanksgiving in India nor am I a big believer in special days. However, I certainly believe in the concept of giving thanks for all the abundance we enjoy. ~ International Positive Psychology Association Newsletter April 2008. While it’s easy for us to stop and be grateful for the ‘big’ blessings – passing an exam, a loved one being restored to health, getting an unexpected raise – we often tend to take the ‘little’ blessings for granted. Slowly, we become immune to all the goodness around us – the beauty of a sunset, the refreshing feeling after a bath, the comfort of a hot cup of tea, the smile of a child and all the little things that our loved ones do for us. We begin to lose our ability to focus on abundance and discontent starts to creep into our lives. Gratitude is something that I’ve come to believe in very strongly. I am trying to live with an attitude of gratitude in my daily life and although it takes practice, I know it works wonders with my well being. I am convinced that having an attitude of gratitude has saved me from going down the slippery slope of blame, regret and self-pity. “she had dropped to her knees in gratitude. It seemed appropriate to have a series on this subject on Everyday Gyaan this November. I will have some great bloggers posting their take on gratitude and I will be sharing various resources that will enable us to focus on the attitude of gratitude. So watch out for a post every day for the next ten days! What does gratitude mean to you? Do you have an attitude of gratitude? Do you have a ‘gratitude story’ to share? Please send me your responses here (with a link to your blog, if you have one) and I will include them in a post on 18 November. … there is always something to fall upon my knees about in thankfulness and prayer. I am grateful to have a new Facebook/blogging friend and for the opportunity to guest post! I have so many things in my life for which I give thanks, both large and small. I have a loving family and friends, the freedom to say and write what I believe. I savor my morning coffee and reading/writing time, my pushy calico cat, and so many little things that make like sweet. Thank you for making a place for us to remember the good things in life. Yes, gratitude in the attitude is the best way to practice it. I find it impractical to fix a time for gratitude and thanksgiving everyday or every week, it works wonderfully when it comes to our attitude and everyday living, and then it becomes a way of life.. It is so like you to do this Corinne. Looking forward to the next ten days. Gratitude is the best way to celebrate life and insure happiness. I take a few moments every day to appreciate all the things I take for granted. I appreciate you, Corinne. I am glad you are my friend. I’ve observed over the years that it’s the little things that bring us great joy. So I am grateful for all the little things that bring me joy. 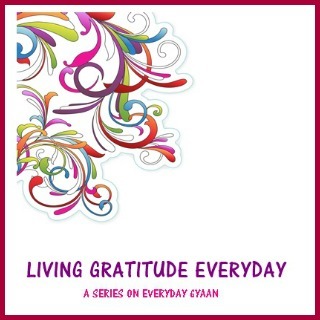 Looking forward to your gratitude series. I’m so looking forward to your series. I do my best to live with gratitude every day. There is so much to celebrate in life with love and gratitude. Thanks for the post! One of my favourite mantras is “Things could always be worse”. Gratitude for the good things in life has seen me through many a rough period. Looking forward to the series. Thank you for setting this up! Yes, I know, Bindu. I’ve been falling in love with gratitude over the years! 😉 I’m so excited about the week ahead. I am grateful for people like you. That continues to inspire me with their words and thoughts. As I am grateful for you, Adriana. Your creativity and authenticity is an inspiration to me.